I’ve not done substantial writing during the past eight years. Most of my work during my second act has involved writing for the web, social media, and this blog. My fascination with long-form writing hasn’t stopped, which is why I attended the 2017 Midwest Writers Workshop this past week. Held in my hometown and attracting nationally known writers, the conference was a great opportunity to hear writers talk about their craft and get exposed to the business side of publishing. I’ve toyed with writing a novel throughout my life. Allegedly, I have a nearly finished piece of work somewhere on a 3.5 floppy disk. Writing is hard for everyone, but I face two challenges. I cannot type and I like to rework sentences after I finish them. Both can be troublesome when attempting marathon writing sessions. I’ve tried to learn to type, but nearing 50 I don’t think I can train my brain any further. My goal for the rest of the year is to write more. I have several ideas kicking around for a novel, mostly in the scifi and technopolitical thriller genres. Mostly I am writing for myself. Perhaps one day I may get published, but that’s not important for me at this point. My goal is to practice the craf and enjoy creating plots, characters and worlds. I have a few ideas for a non-fiction book, as well. I was discouraged at the conference to learn that an author’s platform — expertise plus audience – is very important to non-fiction writing. It seems these days one needs to have thousands of followers on social media to make non-fiction book ideas a reality. Alas, I don’t want to work that hard on social media. Maybe I should to develop a platform. Social media is a mess these days, though. It’s no longer fun for me. The conference clued me in on a bunch of resources I’ll be devouring during the next few months. I plan to learn the Scrivener program, read some famous books on writing, subscribe to Writer’s Digest, and perhaps attend some more workshops. I also would like to try my hand at the National Novel Writing Month in November. The conference may lead to some other writing opportunities for me, which would be nice. For now, I’ll try to update this blog more regularly. I may even share some of my non-fiction and fiction writing here. Perhaps I’ll start a newsletter and attempt to monetize this blog by being an Amazon Affiliate and offering a PayPal donation button. Regardless, thanks for reading. Today was #NetNeutralityAction Day. Because I work with online communications in the public sector, this is an important issue for me. I’ve contacted my representatives in Congress with my thoughts. Trump’s FCC is currently attempting to roll back the Tittle II regulations which prevent broadband providers (i.e. Comcast) from charging added fees to content provides (Netflix) to carry data. Under the Obama administration, the FCC declared internet broadband a telecommunications utility service and imposed regulations to keep such business deals from happening. In short, it required providers to treat all data content with parity, whether it is from Amazon or NASA. Rollback of the regulations would remove such conditions, and allow service providers to charge more money to content providers for faster speeds and more bandwidth. At face value, this would seem to respect free market principles, but let’s go deeper. Establishing a tier approach to providing content is dangerous. Those companies with deep pockets (Google, Facebook, Apple, Netflix, Amazon) can afford to pay higher fees. But what about government, non-profit, education and other public sector websites? There’s the clincher. If we allow providers to classify and distribute bandwidth based on pay-to-play, those that cannot pay will reach smaller audiences. For example, Rep. Luke Messer’s surveys will be less likely to land in constituents e-mail inboxes. They will also be slower. Education sites such as Ball State University and larger government sites like NASA.gov will also find it more challenging to distribute content. It reaches down to the local level. Consider your town’s website, or your school’s online presence. All could take a dramatic speed hit. Will Congress and the government realize that rolling back Title 2 is a self-defeating action? I doubt it. As we’ve seen this year, ideological trumps pragmatism. I urge you to write you representatives and mention this angle. It may not have even occurred to them. A new state law on July 1 requires children (those under 18 years of age) to wear helmets when riding in off-road vehicles. The law has some upset because it applies to actions on private property. Hoosiers are an independent lot, but the uproar doesn’t seem rational or logical to me. First, people are complaining about the law on the DNR Law Enforcement’s Facebook page. This strikes me as odd. Judging from the comments, many forget the difference between those that write the law (the legislative branch) and those that enforce the law (the judicial branch). People should be voicing their concerns to their representatives in the legislative branch. Complaining on Facebook is not going to be effective. Your right to life, liberty and the pursuit of happiness doesn’t supersede that of your child or of other taxpayers. Your actions on your own property can have negative impacts outside of your property. This is why laws extend to private property so people don’t murder, poach or pollute or harm others or themselves. My take: Some of the comments being left are examples of why the law is needed. Common sense seems to have disappeared from many. Yes, there is a discussion to have about government over-reach and the nanny state, slippery slope, yadda yadda yadda, but this particular situation isn’t the time. When you place political ideology before the safety of your child, you look foolish and irresponsible. In the end, that’s why such laws exist. Since losing about 60 pounds, I’ve attempted to remain active and take better care of myself. I’m now trained in First Aid, CPR and AED use. 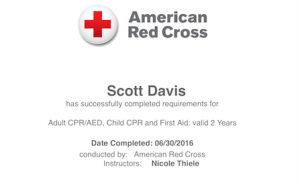 I’ve received my first aid and CPR certification from the Red Cross. I was a student in a class taught by one of my colleagues at work. I volunteered, since I usually sit next to the AED. I had first aid classes when I was a Boy Scout. Much has changed. But now I have a shiny new card good for two years. The State of Indiana also requires CPR certification when renewing a teacher’s license. 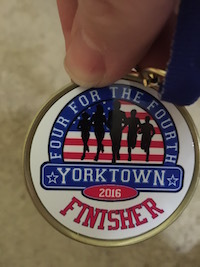 On July 4, I participated in my hometown’s 4 mile run/walk event. My wife put me to shame, but she’s a speedy walker. I go slow and steady. I would have never attempted such an event at my earlier weight. I finished in about 1 hour 30 minutes. Hey, I finished! I felt fine. No aches or pains, no muscle soreness the next day. 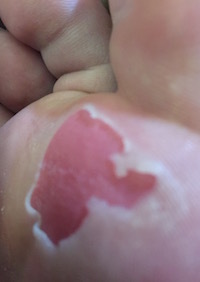 My only major problem were big blisters on the balls of my feet. Ouch. Next time I’ll wear running socks and make sure my shoes are better laced. I survived. I never thought I would finish. But blisters on both feet. I had to drain one. Ouch! 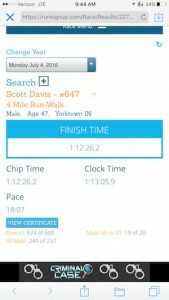 Here’s my race result. I listened to music during my walk to get me into my zone. I continue tracking my exercise with a variety of technology devices, including my iPhone, a Fitbit One, and an Apple Watch. My goal is to exercise twice a week on my recumbent trike. I usually do about 4 miles in 30 minutes around the nearby trail loop. I’ve been documenting my rides with Strava. EyeFi is discontinuing support and service for their Eye-Fi X2 and earlier generation wireless camera cards. Netgear is shutting down the VueZone home wireless video surveillance system. Both companies want to EOL the technology and associated services to put more resources into the newer products. Basically, loyal customers are now left with junk. Neither company is helping loyal customers transition to the new product offerings. EyeFi is offering a discount on their newest generation of wi-fi camera cards, but I found a better price on Amazon. Netgear is not offering any discount for Arlo, their newest wireless home video system. I was quite happy with VueZone. I had two cameras outside (with weather enclosures and brackets), and five internal cameras. One was in night vision mode to monitor the sump pump. All together, I’ve spent about $600 on the system, not counting the $79 annual subscription fee for cloud storage. The VueZone service is only about five years old. I get that old products need to go away so innovation can continue. I have no beef with that. However, when the transition leaves the consumer with junk, that’s a problem. Worse, the newer products often cost more, are less reliable, and have fewer features. What should NETGEAR and Eye-Fi have done differently? It doesn’t take an MBA to figure it out that e-mail with false platitudes won’t keep the customers happy. Instead, offer an exchange program or at least a fifty percent discount off the newer products. I’m not inclined to spend more money with either company. Eye-Fi and NETGEAR may pull the same stunt again. This message is for customers that purchased an Eye-Fi Pro X2 or earlier generation products prior to March 2015. Effective today, June 30th 2016, we will no longer be offering support for our legacy product lines, a complete list of which appears below. This notice formally begins the final stage of the “end-of-life” (EOL) process started in mid-2015 for the affected products. It’s very important that customers cease using these products no later than September 16, 2016 as some key services these products rely on will be shut down at that time. All customers who have a Mobi or Mobi Pro products purchased since 2013 are not affected by this announcement. We began EOL on these product lines in 2015 largely driven by technological obsolescence of some of the key technologies included in these products. The primary technologies relate to Internet security and authentication mechanisms that were state-of-the-art in 2007 when we built them into our products but have since proven to be vulnerable. Since mid-2015 we have been offering migration services free of charge for Customers who have paid Eyefi Premium accounts. We will continue to offer this service migrating your Eyefi View data to Eyefi Cloud. You can request a migration here. For those customers that wish to use an Eyefi Mobi Pro card in place of their earlier generation products, we have also made a limited quantity available at a deep discount, see details here if you wish to take advantage of this offer. Please note that we will maintain our customer service Web site and content for all customers. The support site includes detailed explanations for how to accomplish migration to Eyefi Mobi/Mobi Pro and Eyefi Cloud services. We are grateful to all the customers around the world that used Eye-Fi products in the past as well as for our newest customers. The EOL of a product line is always difficult and we have made every effort to minimize the impact of this change on our customers. Thanks for your loyalty and understanding. This letter serves as formal notification that NETGEAR, Inc. will be discontinuing the VueZone Services on December 31, 2017. We will continue to support the VueZone Services until this date in order to allow for future planning by our VueZone customers. For more information on the discontinuance of the VueZone Services, including a step-by-step guide on how to retrieve your videos and photos from the VueZone cloud, please visit our FAQ page. We know this may come as disappointing news to our VueZone users, but discontinuing VueZone and allocating VueZone resources to our Arlo Smart Home Security System is consistent with NETGEAR’s practice of providing cutting-edge networking products that connect people, power businesses, and advance the way we live. NETGEAR appreciates and values our customers, and we are eager to supply your future product requirements with our world-class quality product lines. Bison at Yellowstone National Park. Photo from YNP Facebook page. The staff at Yellowstone National Park is handling a public relations problem concerning a bison calf and doing it rather well. You can see the evidence for yourself on their Facebook page. To recap, two tourists spotted a starving and weak bison calf in the park and loaded it into the back of their SUV rental in an attempt to find care for it. The problem is such an act of compassion is against law, park regulations and common sense. Because the calf — abandoned by its mother — had imprinted on humans, the park staff had no choice but to put it down. This action has resulted in a social media firestorm on the YNP Facebook page. I urge those passing judgment on YNP staff to consider the following responses left by the park’s social media team on Facebook. They are a great example of communicating natural resource issues to a public that may be ignorant and hostile. In order to ship the calf out of the park, it would have had to go through months of quarantine to be monitored for brucellosis. No approved quarantine facilities exist at this time, and we don’t have the capacity to care for a calf that’s too young to forage on its own. Nor is it the mission of the National Park Service to rescue animals: our goal is to maintain the ecological processes of Yellowstone. Even though humans were involved in this case, it is not uncommon for bison, especially young mothers, to lose or abandon their calves. Those animals typically die of starvation or predation. We do not have a rehab center, nor is it our priority to rescue individual animals. 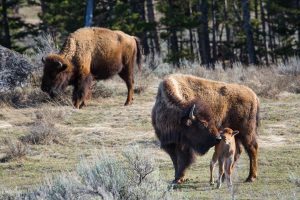 Our mission is to preserve the ecological processes of Yellowstone, and even though humans were involved in this case, it is not uncommon for bison, especially young mothers, to lose or abandon their calves. Those animals typically die of starvation or predation. Since Yellowstone bison carry brucellosis, federal and state laws prohibit their shipment outside the park. This calf would have had to go through months of quarantine to be monitored for brucellosis, and no approved quarantine facilities exist at this time. Rangers tried for two days to haze the bison away from the road and toward other groups of nearby bison, but were unsuccessful. The calf had fully imprinted on people and cars. The management of wild animals sometimes requires decisions that may seem harsh if you focus on an individual. But when you focus on populations of animals, and the ecological processes that sustain them, things like a bison losing or abandoning a calf is part of the fabric this ecosystem. It’s unfortunate that these visitors intervened: the calf may have been found by its mother, but it’s also likely that the calf would have died naturally of starvation or predation. The bison calf was not removed from the landscape: it was left out of sight where predators, scavengers, and other animals could take advantage of it. YNP staff is not getting defensive, just explaining the reasons for the action. I applaud their courage in responding to some of the posts on the page. This is a teachable moment. Of course, there are those that will never accept the word of government employees regardless of the facts. Unfortunately, comments have denigrated into name calling, insults and flame wars. YNP generally is letting people rant. I’m sure the staff is getting death threats. I’ve been in similar situations before. My heart goes out to them. Keep wildlife wild. Leave it alone. It’s hard to do, I know, but it must be done. Visiting a park? Leave no trace. Learn and know the rules. Before passing judgment, get the facts and give the benefit of a doubt to folks even if they work for government. If you don’t like a government action, it’s okay to be critical and voice displeasure. Just do so without name calling and vitriol. 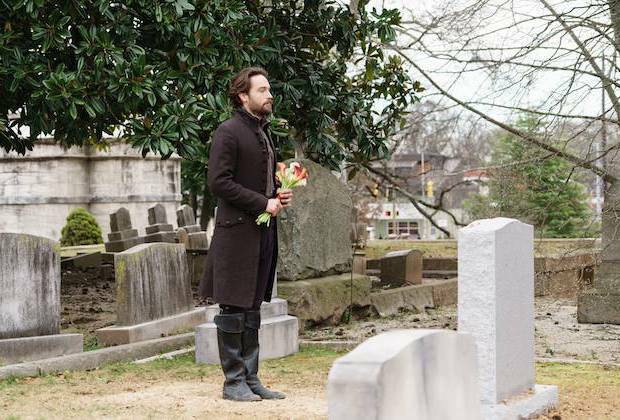 FOX’s Sleepy Hollow has been an entertaining diversion for me for three seasons. The show – about a Revolutionary War solider appearing in present day America to battle demons – has filled a niche missing since The X-Files and Fringe went off the air. Essentially a supernatural police procedural, I found the historical aspects of the show intriguing. It tickled me to see how the writers worked in American history to explore the idea that the nation’s founding fathers were battling demons and the British during the birth of our nation. And, of course, there was the Headless Horseman. Tom Mison was excellent in his performance in the role of Ichabod Crane. He and Nicole Beharie (Abigail Mills) had tremendous on-screen chemistry. Even when the writing was sub par, their acting chops carried the show. Season three has been a bit uneven and audience has dwindled since the first season. The last two episodes of season were a downer. Both contained major character deaths. In the series finale, Mills died, leaving Crane to face new challenges alone. I barely recognized the show from the finale. Too many threads were trying to be resolved in 42 minutes. Supporting characters barely got a chance to say bye. It is doubtful that the series will get renewed. After watching the season 3 finale, that may be for the best. Imagine if The X-Files killed off Scully? Still, if Hollow does get renewed I will turn in just to see Mison’s performance and how his character moves forward. For those that have not seen the series, I urge you to give it a shot even though you might be disappointed at the end. Video montages from all the Trek series and movies display on the 40-foot screen and were synchronized to music from a symphony orchestra. 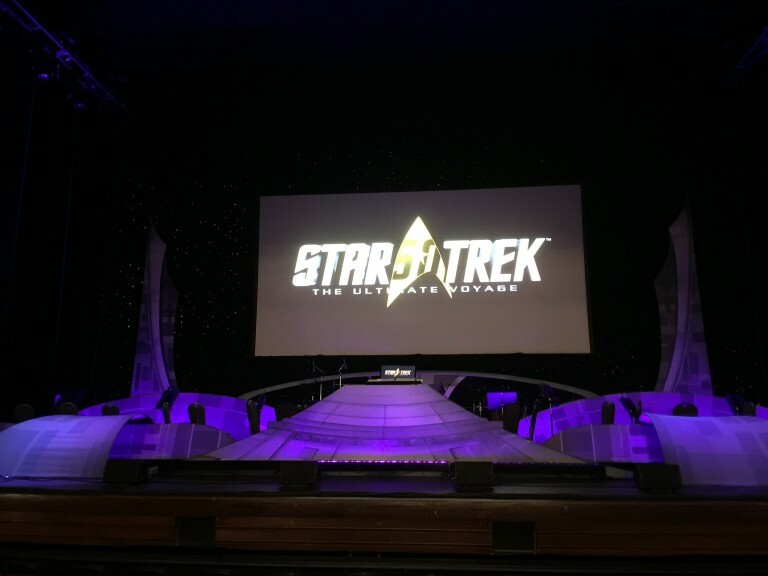 For my belated birthday gift, my wife bought tickets to the Star Trek Ultimate Voyage Tour. We attended the concert at the Old National Center in Indianapolis on Friday, March 18. The event featured music from fifty years of the Star Trek, spanning both the TV series and movies. The scores were performed by a live symphony orchestra and timed to video being projected on a 40-foot screen. The concert was a treat for the ears and eyes. The orchestra highlighted the nuances often found lurking in Trek scores. While everyone knows Trek music can be “in your face” — the fight theme from Amok Time comes to mind — the elegant violin and trumpet solos of later Trek music are often overlooked. The soloists brought the stately and sweeping motifs to life. The trumpet soloist on the Deep Space Nine Theme was particularly notable. The digital projection of the video was pretty much flawless, too. The production used remastered and digital copies of the source material. Colors were vivid and scratches and grain were absent. Even darker scenes displayed well, such as those set inside a Klingon ship. Editing was polished. Instead of lifting entire chunks from the source material, the production combined visual effects sequences, action scenes and dialog into a seamless montages focused on a central themes such as “villains” and “captains.” Michael Dorn, Lt. Worf from The Next Generation and Deep Space Nine, provided a recorded introduction narration for each. The audience for the event was an older crowd, mostly middle age. There weren’t a lot of costumes, but many had t-shirts or lapel pins. The audience was enthusiastic, especially after one clip from the original series episode The Doomsday Machine in which Kirk finally defeats the planet killer. The experience rekindled my love of Trek scores, many of which I have on CD. I’m more fond of music from the later years of Trek. James Horner’s score for Star Trek II: The Wrath of Kahn (KAHHHHHHNNNN! ), is a masterpiece. Jerry Goldsmith’s theme for the first Trek movie is better than the movie itself. I’m glad it became the main theme for Star Trek The Next Generation. Also among my faves are the opening themes for Deep Space Nine and Voyager. And yes, I did like Faith of the Heart for Enterprise, although it is sappy. If you get a chance, check out Archer’s Theme on the Enterprise soundtrack. This was the original theme for that series and is on par with earlier opening themes. Other movie favorites include Generations and First Contact. Star Trek Ultimate Voyage Tour is visiting 100 cities this year. If you are a Trek fan, I recommend it. It’s a great way to celebrate fifty years of Trek music. 2001: A Space Odyssey on the big screen. The real big screen. Original promo for 2001: A Space Odyssey features artwork of Space Station V by artist Robert McCall. Last week I had the rare opportunity to view director Stanley Kubrick’s classic space film in 70mm at the Indiana State Museum’s IMAX theater. The screening was part of IndyFilmFest’s Roving Cinema series. The film played to an at-capacity crowd of mostly film buffs and college students. Yes, it was an intellectual nerd fest. 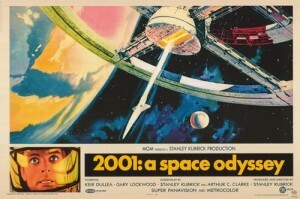 2001 (1968) was originally filmed in 70mm, a common film size in the 1950s and 60s. The 70mm “flavor” for Kubrick’s work was Cinerama. You can learn more about the specific format here. This particular print was a restored version struck in 2001. Most movie theaters today screen films in digital format, even the IMAX theaters. That technology continues to mature, especially with colors and brightness. Analog film and projectors still offer superior image quality, but the technology is expensive and rapidly being replaced. This print was not a true IMAX-optimized film, just 70mm. Still, the image was 70 feet wide. The film did have some artifacts such as grain and scratches and a few slight audio pops, but overall it was in good shape and played well on the IMAX’s six-story screen. Director Kubrick was known for his attention to details, and this was clear in the 70mm version. The space station docking and lunar shuttle sequences were especially stunning. With 70mm, it was easier to see the people in the windows of the station and the moon base. Set detail — especially warning labels and company logos — were also more obvious. It was a good display of Kubrick’s world-building skills. One could even read the instructions for the zero gravity toilet on the lunar shuttle. And seeing the monolith on a six-story screen was pretty intimidating, too. For me, the greatest strength of 2001 is the craftsmanship. I found the plot thin and slow, but I realize Kubrick wanted to make space travel seem boring and monotonous. I’ve got several books about the film’s making, including the latest from Piers Bizony. The film – and its under-appreciated sequel 2010: The Year We Make Contact — are among my top favorite movies. A small monolith and moon bus model sits atop my DVD collection. The Indianapolis State Museum IMAX is one of my favorite IMAX theaters. Comfortable seats and often less crowded, there’s little comparison to the “IMAX light” digital theaters in Indianapolis suburbs. Indy IMAX uses the original analog IMAX projectors. The theater is 20 years old. As of Jan. 25, the theater was undergoing renovations to add digital equipment for more screenings of modern films (press release). Automatic Adapter plugs into the OBD-II port in your car. Vehicles manufactured after 1996 have an OBD-II (on-board diagnostic) port. Wikipedia has a great explanation about the connector. The port, usually found near the steering wheel, is used by mechanics to diagnose car trouble. In addition to troubleshooting, many consumers use the OBD-II port to tune their vehicle’s performance and keep track of teenage drivers. I’ve been using a OBD-II gizmo called Automatic ($99) for more than a year. The device plugs into the OBD-II port and pairs via bluetooth to a smartphone. 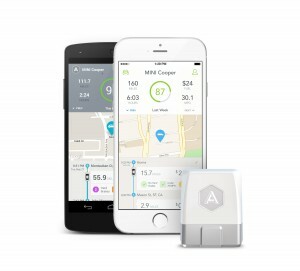 A companion app collects trip data from the vehicle, including location, distance, mileage, time. It’s like a black box for the car. This data is displayed on a map in the app and an online dashboard. One nice feature about Automatic is that it determines the dollar cost and efficiency of each trip. It’s pretty spot on, too. My previous car — a Sonata Hybrid — was always scoring high. My current Hyundai Tucson scores well, but not as as good as the hybrid. The dashboard for the Automatic service displays trip data. Copyright © 2019 Indiana Gadget Guy.